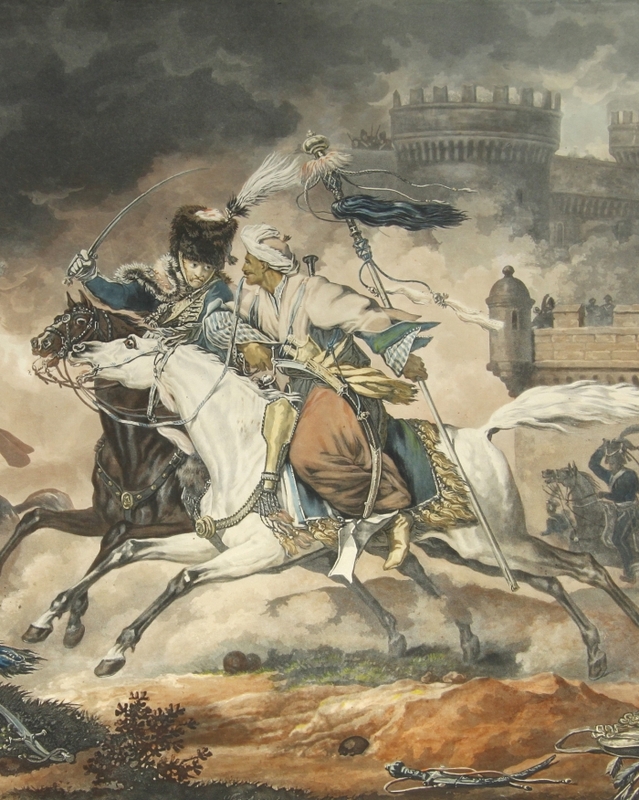 Carle Vernet: 'A Mameluk Leading His Horse' and 'Fight between a hussar and Mameluk'. Two aquatint etchings in color, enhanced with watercolor. 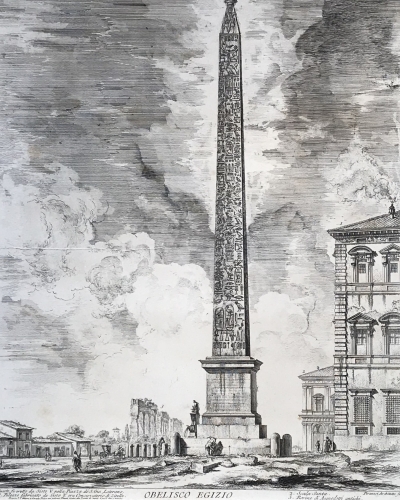 Engraved by Philibert-Louis Debucourt (1755-1832) after paintings by Carle Vernet. Printed by Daude and published by Charles Bance & Aumont in 1820. The aquatint 'Combat' with the year 1811 in the plate for the year in which the original painting was made. 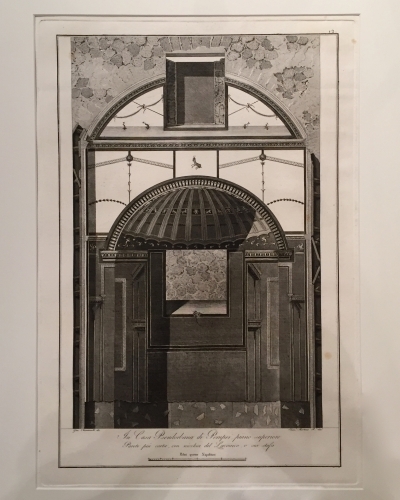 In 19th century frames with title description in French. One aquatint with no margins, the other with folded margins. Antoine Charles Horace (Carle) Vernet was a French painter, the youngest child of Claude Joseph Vernet, and the father of Horace Vernet. Born in Bordeaux, Vernet was a pupil of Nicolas-Bernard Lépicié. 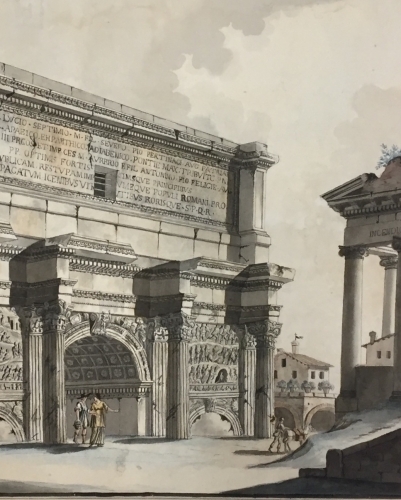 After being awarded the Prix de Rome in 1782, the painter spent some time in Rome. Vernet joined the Paris painting academy in the course of the same year as the outbreak of the French Revolution. 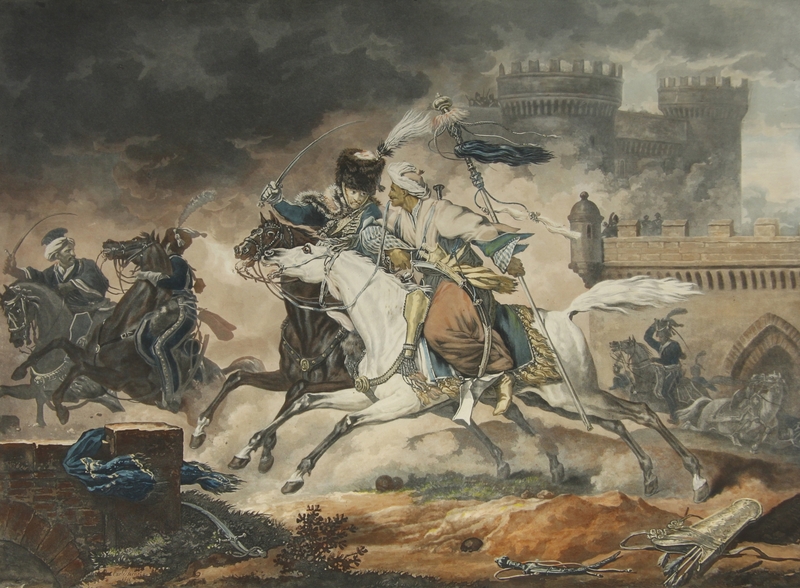 1799 was a crucial turning point in Vernet’s oeuvre: he exhibited drawings from Napoleon’s Italian campaign in a new and original style, which has prompted scholars to argue that Vernet’s contribution was essential in introducing strategy and verisimilitude in contemporary battle painting. This was in large part due to his exceptional ability to paint horses. Napoleon awarded him the Legion of Honour. Louis XVIII awarded him the Order of Saint Michael. 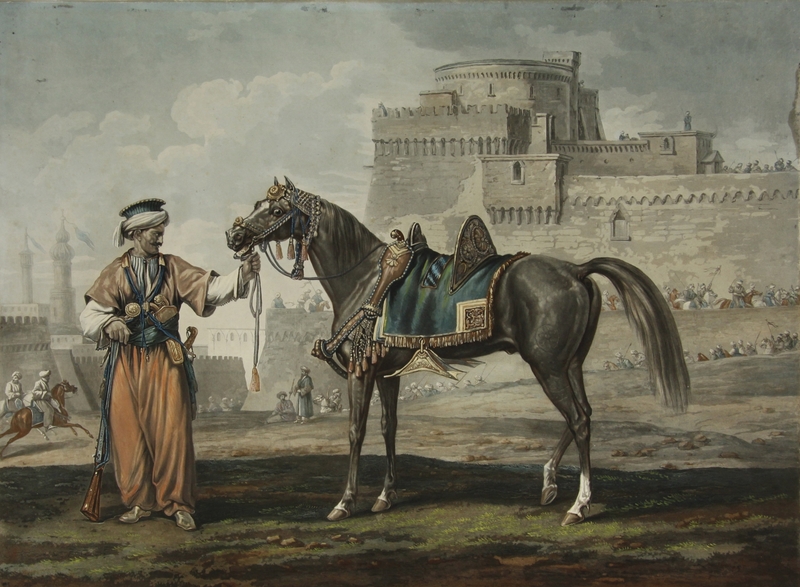 These aquatints depict Mameluk soldiers, renowned for their ferocity and superb abilities as cavalrymen. A Cairene citadel can be seen in the background. The Mameluks began as a slave warrior caste in the 9th century, created by Muslim rulers. They later became landowners and rulers in their own right, primarily in Egypt. By the Napoleonic era, their influence was on the decline, however, they were still a fearsome fighting force. Napoleon defeated the Mameluk army when he invaded Egypt in 1798, but was greatly impressed with their courage. He created a special Mameluk corps in the French army, and he, himself, had a Mameluk body guard named Roustan. 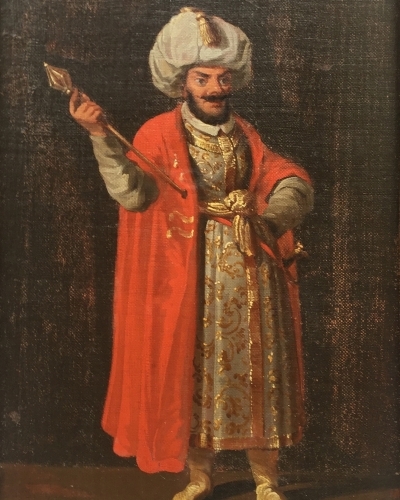 In one of these aquatints, the Mameluk is armed with a scimitar, rifle and brace of pistols, and wears the uniform of the Napoleonic squadron before 1804: the green cahouk (hat) wrapped with a white turban, red sarousal (trousers), loose white shirt and waistcoat.